The introduction of solid-state drives (SSDs) for computers has changed the user experience. Loading times, responsiveness and transfer speeds have all improved greatly. The latest advancements in SSDs revolve around increasing each of these parameters by using faster NAND and storage-optimised interfaces such as NVMe. That's all well and good for the enthusiast, but the big players in the SSD market know that real volume is shifted by selling entry-level SSDs destined for desktop and notebook PCs retailing for under £1,000. In these markets, the SSD size, availability and reliability is more important than cutting-edge speed. And this is where companies such as Crucial make their SSD bread and butter. The entry-level BX200, available in capacities between 240GB and 960GB has done well, but now the firm is back with its successor, aptly named the BX300. BX300's remit is to entice those looking for an attractively-priced SSD for a modest build, so it makes sense to run with 120GB, 240GB and 480GB capacities. Let's take a closer look at the specifications. As with the previous generation, the BX300 is only available in a 2.5in form factor presented in aluminium casing that is 7.5mm high. Perfect for desktops and older laptops, but not the ideal choice for the performance junkie who now favours NVMe M.2. Sequential read and write speeds, quoted as out-of-the-box figures, are healthy for the three capacities. Crucial continues to use the SLC write acceleration technology found in its predecessor, where a small portion of the NAND is converted into one-bit-per-cell SLC mode for faster accesses. Speaking of modes, the biggest change between generations is Crucial's decision to go back to using multi-level cell (MLC) NAND instead of cheaper triple-level cell (TLC) employed by the BX200. This is a good move from a reliability standpoint because it means that drive longevity should be improved as fewer accesses are made to each cell. 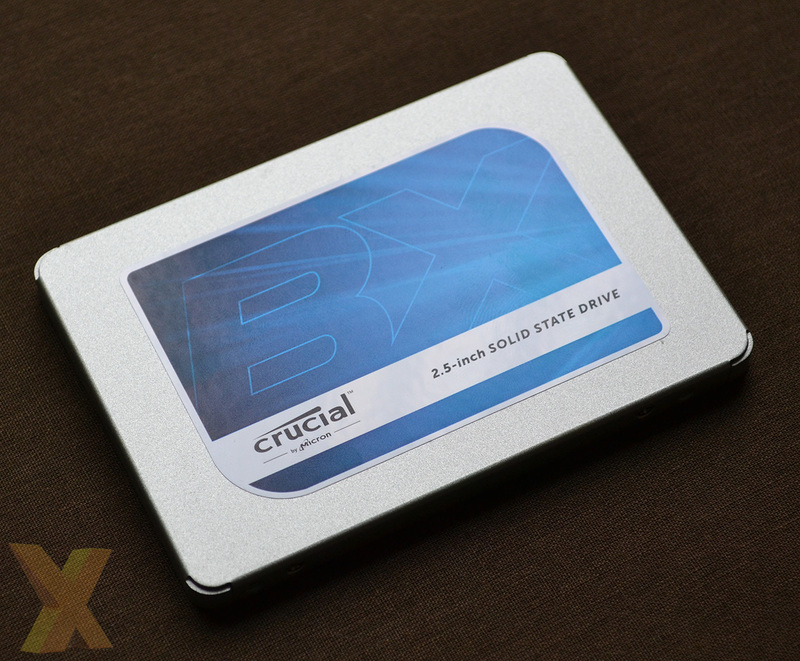 Crucial backs up this assertion by increasing the BX300's endurance compared with the older BX200 in all but the 120GB drive. Whereas BX200 had a set 72TBW figure, equating to around 40GB of writes per day over five years, the 240GB and 480GB BX300 stretch this out farther, to 80TBW and 160TBW, respectively. As we have the 480GB model in for review today, that equates to writing 88GB every day for five years, or far more than what would be expected for a drive of this ilk. Really, the BX300 shares more in common with the performance-orientated MX series. And the NAND used is of the 3D variety, where 32 layers are effectively placed on top of each other to increase density, as Samsung has done so for some time. Crucial understands that it has serious competition in the entry-level market and thus going to 3D MLC NAND means that while profit margins may not be that high on this part, performance ought to be decent. The new-fangled NAND interfaces with a newer Silicon Motion (SM2258) controller backed by Micron's own low-power DDR3 memory, though a version of the controller, known as XT, can run without supporting DRAM. This SM controller offers a four-channel interface and is compliant with 128-bit AES encryption and the Trusted Computing Group Opal v2.0 standard, but Crucial does not apply either on the BX300. Nor is the drive compatible with Microsoft eDrive. Other than that, all of the specifications appear to be robust. Peak read and write speeds are as good as SATA generally allows, the random IOPs rating is healthy for the 240GB and 480GB models, whilst the warranty is a standard three years. There's nothing new on the appearance front, as the BX300 shares the same casing, look and feel as other Crucial SSDs. The difference, obviously, is on the inside. 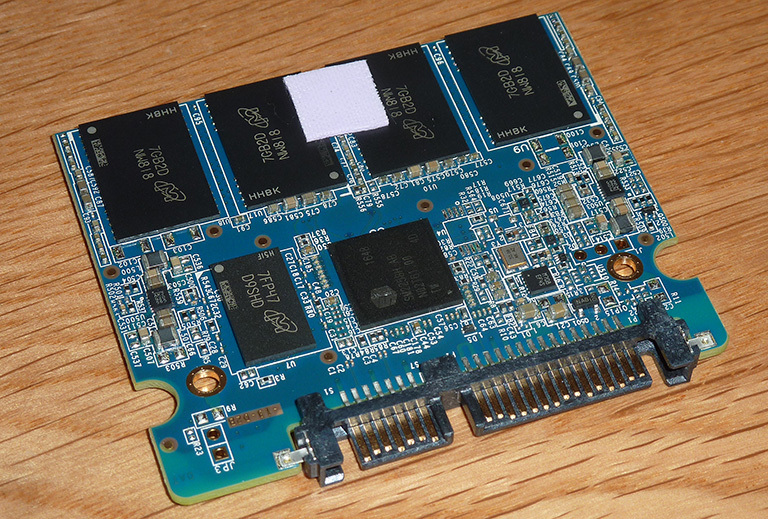 The small board is equipped with eight dies - four on each side - that together make up the 512GB of nominal capacity. Crucial sensibly holds 32GB back for overprovisioning. Silicon Motion's SM2258 controller is clearly visible in the middle, flanked on the left by 256MB of in-house DDR3 for buffering duties. Crucial also bundles in an adapter for systems that work best with 9mm-high drives, and usefully, continues to add in the handy Acronis True Image HD software for easy migration from another drive. We expect performance to be decent in the kinds of workloads used on entry-level PCs, so lots of consistent sequential throughput. Let's now put it to the test.